What are the reception hours of Alto Hotel On Bourke ? 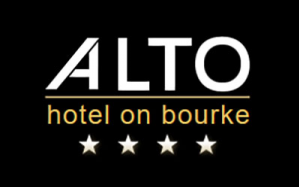 What is check-in and check-out times for Alto Hotel On Bourke ? What is the phone number for Alto Hotel On Bourke ? What city Alto Hotel On Bourke is in ? What is mailing address for Alto Hotel On Bourke ? What credit cards are accepted by Alto Hotel On Bourke ? How far are you from the Skybus Airport bus terminal? How far are you from the Southern Cross Station? How far are you from the Trams and how do I pay for the tram ride? Do you have car-parking on premises? How far are you from shopping, restaurants and cafes? Do you have a restaurant? Do you serve breakfast and dinner at the hotel? How far are you from the CBD [Central Business District]? How far are you from the or Bourke St. Mall, or centre of the CBD? How far are you from Etihad Stadium? How far are you from Docklands? How far are you from the Exhibition Centre? Do you have a Massage Room at the hotel? Do you have High speed Wi-Fi and Cable internet? Do you have weekly or long term rates? Do you have a Sustainable Business model? Are you a "green" Hotel?